(From Samsung lens literature) Coinciding with the introduction of the GX-10, Samsung is also pleased to announce that five new Schneider lenses will be available for use with its entire GX series of DSLRs. The new lenses will consist of a 10~17mm, f/3.5-4.5 fish-eye zoom, a 12~24mm, f/4 ultra-wide zoom, a 16~45mm, f/4 wide zoom, a 35mm, f/2 fixed focal length and a 100mm, f/2.8 macro lens. When combined with its existing 18~55mm and 50~200mm Schneider D-XENON zooms, the five new lenses will give Samsung the ability to offer photographers a full, comprehensive range of optics, allowing them to expand their creativity as well as be prepared for any shooting scenario. For added convenience the GX-10 can be used with the all Pentax KAF2, KAF and KA mount lenses. 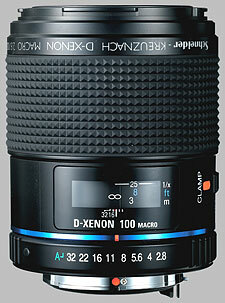 See our entry for the Pentax twin of this lens here. The Samsung 100mm f/2.8 Macro Schneider D-XENON doesn't have any user reviews yet!